This is a partial listing of American trading card sets featuring Superman. 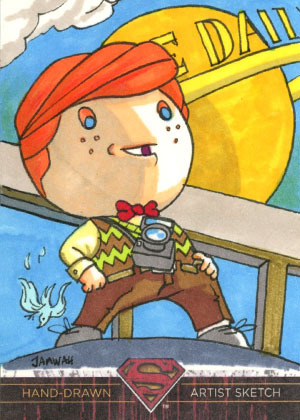 As with comics most of the card sets recently published generally should be purchased for enjoyment, not investment. Dealers often sell the inserts (e.g. skydiscs, holograms, promotional) separately and these are more collectable than the ordinary cards. The listing format gives the number of common cards in a set followed by a list of the various bonus inserts for the set. For newsgroup trading of superhero trading cards try rec.collecting.cards.non-sports. For discussing general cards use rec.collecting.cards.discuss. This listing is for informational purposes only. It is not a Want List. It is not a For Sale List. Collect your favorite citizens of Metropolis with the trading card set dedicated to the Man of Steel, Superman! Written by comic book writer Adam Beechen, the cards will provide insight from an insider's perspective. Superman has appeared in many forms and costumes, and one of the chase sets will take a look at some of the fan favorites. Sketch cards will be included in every 24 packs, so be on the lookout for your chance to collect an original piece of art based on one of the greatest Super Heroes of all time! Binder:�The limited edition binder contains an exclusive foil promotional card.�The Diamond Previews exclusive binder contains�reprints of 9 exclusive sketch cards, the originals are randomly inserted into the binders. This much-anticipated release features an 85-card base set along with randomly inserted cast autographs and wardrobe memorabilia, including pieces of Clark Kent's red leather jacket and the Blur's black trench coat. 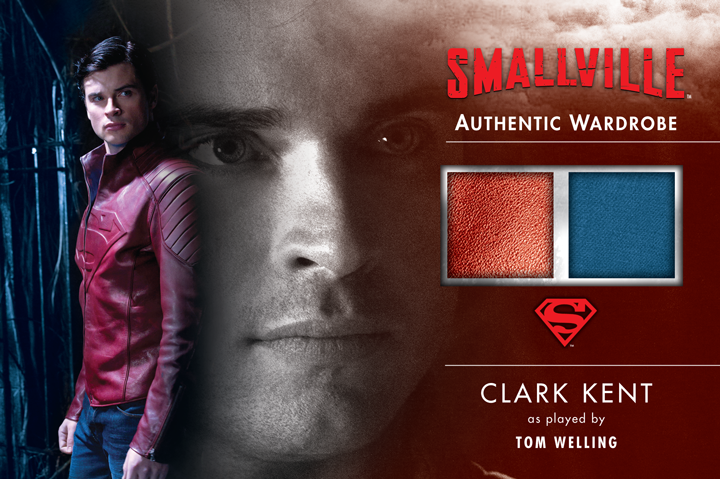 The Smallville Seasons 7-10 Trading Card set also offers randomly inserted autograph cards bearing the signature of Callum Blue (Zod), Sam Witwer (Davis Bloome), John Glover (Lionel Luthor), and more. 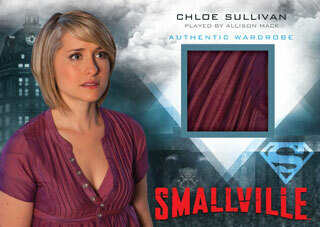 Redemption Cards: R1-R25 - Oversized card (4"x6") containing a piece of Clark Kent's red leather jacket and blue t-shirt. Promotional Cards: P1 Non-Sport Update Magazine April/May 2012, P2 Distributor Card May 2012, P3 Philly Non-Sports Card Show April 2012. Rittenhouse Archives presents Justice League of America Archives Trading Cards, the first-ever trading card set to feature the JLA, including Superman, Batman, Wonder Woman, Flash, Green Lantern, Aquaman, and more! 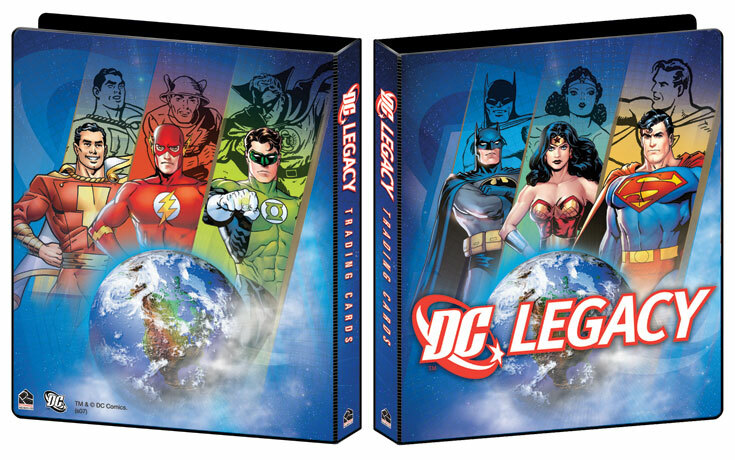 The 72-card set features full-color art on the fronts and classic comic covers on the back. 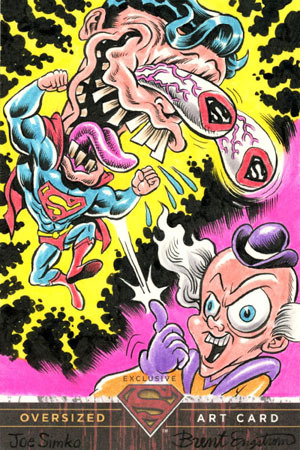 Bonus chase cards include an 18-card Superfriends cartoon bonus set, as well as 1 Hand Drawn Color Sketch Card per box! 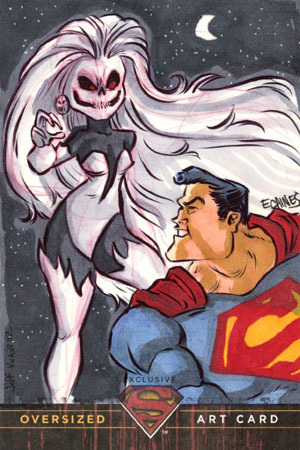 Look for sketch cards from Warren Martineck, Andy Price, Pat Broderick, Kate Bradley, Mark Spears, Tone Rodriguez, and dozens more! Collectors will be looking to store their set in a custom-designed album, with 9-pocket pages and a bonus promo card. 5 cards per pack, 24 packs per box. JUSTICE - A nine card puzzle featuring Clark Kent and the other future heroes! (9 different cards - inserted approximately 1:11 packs). 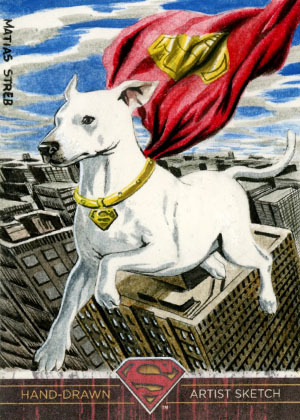 THE POWERS THAT BE - Six cards that present spectacular images of Clark Kent's extraordinary abilities. (6 different cards - inserted approximately 1:17 packs). 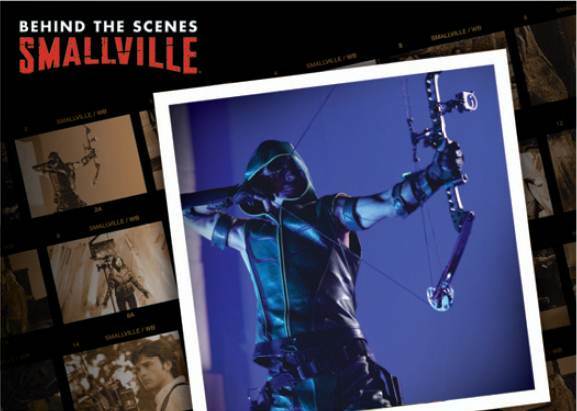 ARCHER'S QUEST - Three cards showcasing the exciting Season Six debut of Smallville's newest hero, "The Green Arrow'! (3 different cards - inserted approximately 1:35 packs). THE WRATH OF ZOD - A special case loader card. (1 card - 1 per shipping case). ALLIANCE FOR JUSTICE - RETAILER PRE-ORDER INCENTIVE - two unique, puzzle autograph cards featuring the memorable "heroes-in-costume shot" from the "Justice" episode. Each card includes TWO autographs. Card AJ-A features autographs from Justin Hartley as Green Arrow AND Kyle Gallner as Impulse. Card AJ-B features autographs from Alan Ritchson as Aquaman AND Lee Thompson Young as Cyborg. Uncut Mini-Press Sheet "JUSTICE" - Only 199 nine-card uncut and sequentially-numbered limited edition mini-press sheets will be available. 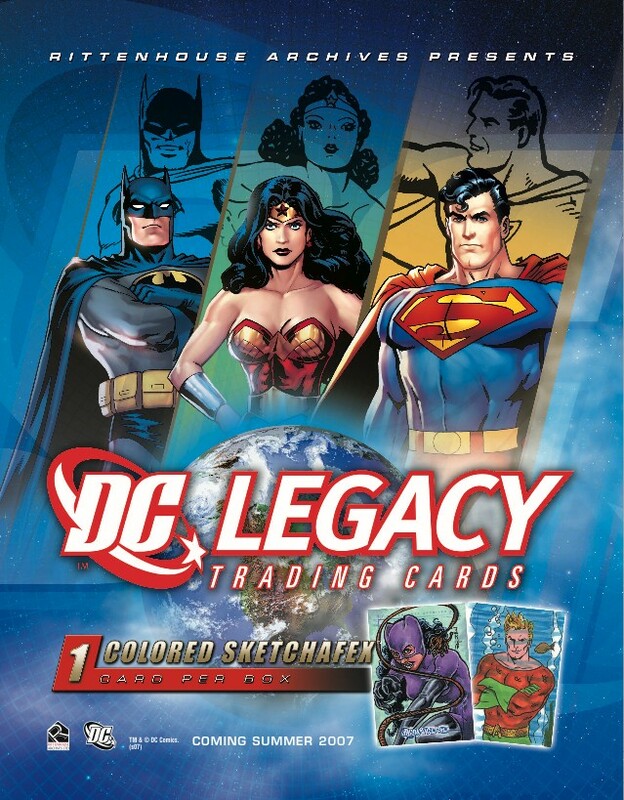 SKETCH CARDS - Each box of this ground-breaking series will contain ONE hand-drawn colored Sketch Card - a first for any DC trading card series! Insert Sets - 50 Gold Parallel Cards (1:6 packs). 9 First Title Covers (1:12 packs) - First Title Cover issues of BATMAN, SUPERMAN, WONDER WOMAN, FLASH and others. 9 DC Gallery (1:24 packs) - Showcasing the artwork of Alex Ross. 6 Legendary Heroes (1:48 packs) - Your favorite heroes in lenticular motion! Each case includes an exclusive autograph card signed by Denny O'Neil. For every 3 cases purchased, you will receive a one-of-a-kind hand-drawn regular sized sketch card from industry legend Nick Cardy or Luis Dominguez. For every 9 cases purchased, you will receive a one-of-a-kind hand-drawn and colored sketch card by artist Cat Staggs or Mark Spears on an oversized 5"x7" sketch board. Fans and collectors will also be able to store their collection in a custom designed collector's album which contains an exclusive autograph card signed by Joe Kubert as well as an exclusive promo card. ALSO - Three box loaders "Vengeance from Krypton" (3 cards that spell out "ZOD" - 1 per display box) and one special case loader "Banished" (1 card - 1 per case). FRIENDS - Retailer Multi-Case Pre-Order Incentive Cards: Two puzzle Pieceworks® Cards (PW-11A & PW-11B) featuring John Schneider (Jonathan Kent) and Tom Wopat (Jack Jennings). Uncut Mini-Press Sheet "TRIANGLES": Only 199 nine-card uncut and sequentially-numbered limited edition mini-press sheets will be available. Tattoos - 50 Superman tattoos to collect & wear! Plus 1 piece of bubblegum! 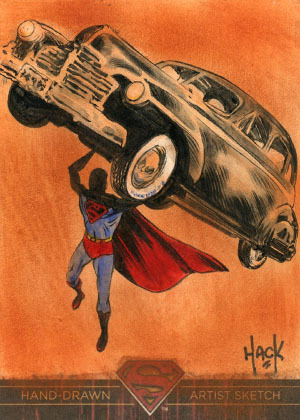 Movie Cards - 90 Action-Packed Cards celebrating the Man of Steel's triumphant return to the big screen! 6 FOIL CARDS - "SWITCHCRAFT" - inserted approximately 1:17 packs. PLUS - 3 BOX LOADER CARDS & A SPECIAL CASE LOADER CARD ADD TO THE COLLECTIBILITY! "LOIS AND CLARK" - A nine-card foil and embossed puzzle. Inserted approximately 1:11 packs. "SWITCHCRAFT" - Six foil cards inserted approximately 1:17 packs. PLUS - Three Box Loader Cards and a Special Case Loader Card! AUTOGRAPH CARDS - ONE PER BOX! Nine different autographed cards including: Camille Mitchell (Sheriff Nancy Adams), Felecia Bell-Schafer (Judge Abigail Ross), Jesse Metcalfe (Van McNulty), Jonathan Taylor Thomas (Ian Randall), William B. Davis (Mayor Tate), Adrianne Palicki (Kara), Teryl Rothery (Real Estate Agent), Neil Flynn (Pete Dinsmore), and Michael McKean (Perry White). Inserted approximately 1:36 packs. 7 PIECEWORKSR CARDS - ONE PER BOX! 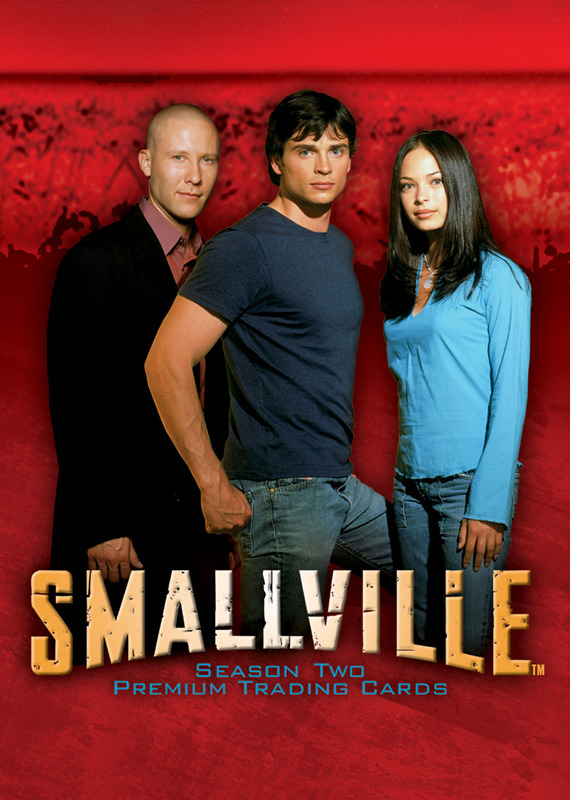 Featuring show-worn costumes from Clark (Tom Welling), Lex (Michael Rosenbaum), Lana (Kristin Kreuk), Pete (Sam Jones III), Chloe (Allison Mack), Martha Kent (Annette O'Toole), and Jonathan (John Schneider)! 6 FOIL CARDS - "DEPARTURES" - inserted approximately 1:17 packs. 3 BOX LOADER CARDS & A SPECIAL CASE LOADER CARD ADD TO THE COLLECTIBILITY! PIECEWORKSTM CARDS - ONE PER BOX! Eight different cards featuring show-worn costumes (8 different cards, inserted approximately 1:36 packs). PW1 - Shirt worn by Tom Welling as Clark Kent in "Exodus", PW2 - Jacket worn by Kristin Kreuk as Lana Lang in "Accelerate", PW3 - Dress worn by Allison Mack as Chloe Sullivan in "Exodus", PW4 - Shirt worn by Sam Jones III as Pete Ross in "Redux", PW5 - Shirt worn by Annette O'Toole as Martha Kent in "Witness", PW6 - Shirt worn by John Schneider as Jonathan Kent in "Visage", PW7 - Shirt worn by John Glover as Lionel Luthor in "Suspect", PW8 - Shirt worn by Michael Rosenbaum as Lex Luthor in "Witness". "THE DAY IS COMING" - Nine card foil and embossed puzzle. (9 different cards, inserted approximately 1:11 packs). "TILL DEATH DO US PART" - Six foil cards. (6 different cards, inserted approximately 1:17 packs). "SEARCH FOR KRYPTONTM" - Three box loader cards (3 different cards, 1 per sealed display box). "THE KEY" - One special octagonal die-cut case loader card (1 card, 1 per sealed case). COLLECTOR ALBUM: The most attractive way to store your Smallville: Season Two collection is with a premium printed and padded vinyl binder. "THE DAY IS COMING" 9-CARD UNCUT MINI PRESS SHEET: Only 299 sequentially numbered sheets available. Sold on a first-come, first-served basis. Autograph Card: Bruce Timm - Justice League Producer and Designer. 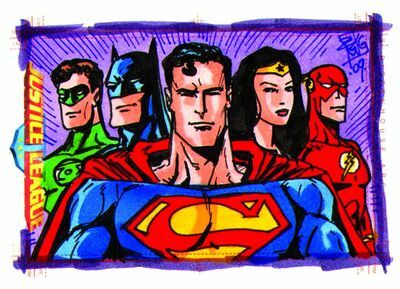 Sketch Cards: Individually drawn, original sketches from the following Justice League animation artists: Sung-Man Huh, Jin-Seok Park, Won-Jae Lee, Jong-Myung Bae, and Byung-Gi Lee. Friends and Foes Cards: 18 foil cards to collect featuring the friends and foes of the Justice League. World's Greatest Heroes: 9-card foil puzzle. ActionWorks Cards: Seven cards that showcase each of your favorite Justice League heroes with lenticular zoom action! ActionWorks Case Loader: A special lenticular card featuring all of the Justice League heroes on one card. Justice League Promo Cards: Superman (1 of 7), Batman (2 of 7), Wonder Woman (3 of 7), The Flash (4 of 7), Green Lantern (5 of 7), Hawkgirl (6 of 7), and Martian Manhunter (7 of 7). 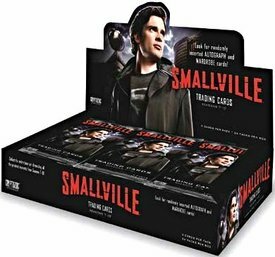 Smallville High: A 9-card foil puzzle featuring Clark, Lex, Lana, and the gang. Inserted approximately 1:11 packs. Spring Formal: Six cards featuring your favorite characters in their formal dance attire. Inserted approximately 1:17 packs. Pieceworks Cards: Four different cards embedded with Clark's t-shirt, Lana's jeans, Pete's shirt and Jonathan's plaid shirt. Autograph Cards: Six different autographed cards (to be announced). Special 9-card Preview set was released on July 31, 2002. Only 2,500 made available world-wide. The set includes a title/cast card and 8 cards featuring the main characters from the show: Clark, Lana, Lex, Chloe, Pete, Whitney, Martha, and Jonathan. PR-1 Foil Version - San Diego Exclusive Foil-Topped Preview Set (600 numbered sets). Card PR-1 is printed on foil. 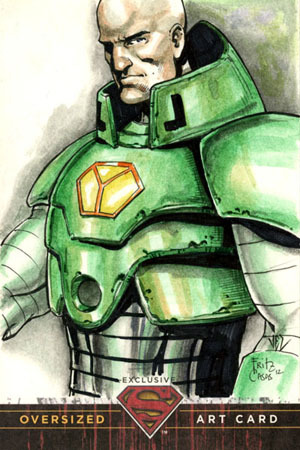 Available at 2002 San Diego Comic Con. 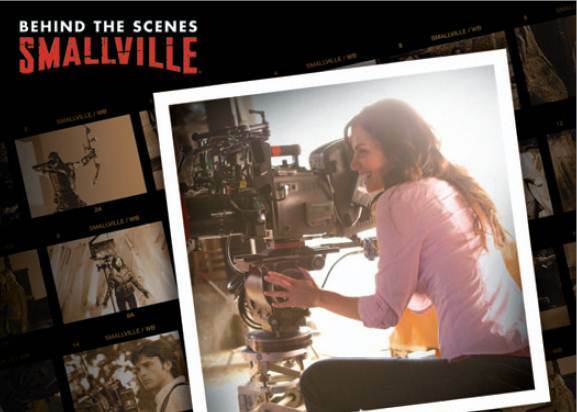 There were also some Smallville promo cards created (e.g. 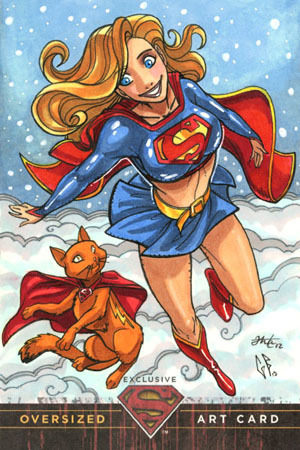 SM1-SD, which were given out at the San Diego Comic Con 2002 to promote the full "Smallville: Season One" set) as well as cards created for other products (e.g. 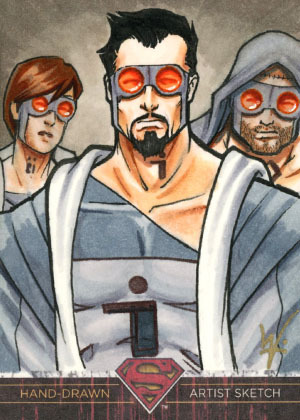 A1-A3 which were included with Smallville Action Figures). 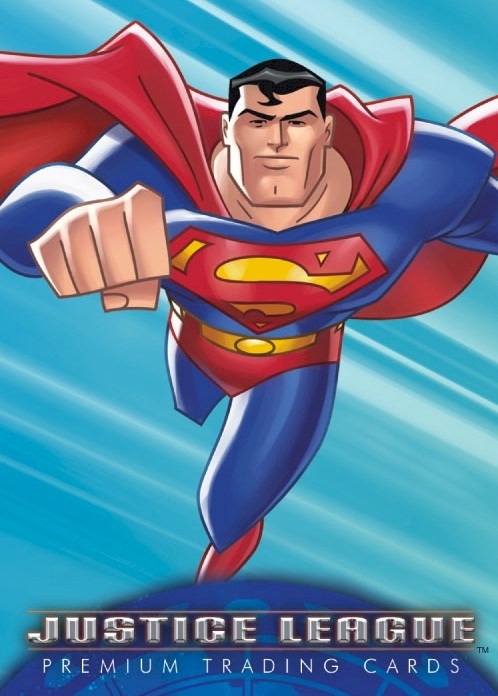 Tie-in with the Superman animated series. Limited Edition of 20,000 numbered Boxes tie-in to the 1996 4-part Elseworlds Kingdom Come mini-series, featuring Superman. Based on the Amalgam comics published as part of the 4 issue DC vs. Marvel mini-series. The Amalgam Comics series included Super-Soldier which combined Superman and Marvel's Captain America. The 100 cards feature five subsets and a checklist card. The three subsets are DC Heroes (12), Marvel Heroes (12), Rivals (11), Hero vs. Hero (16), and Hero vs. Villain (15). On the backs are comments by reporters Clark Kent and Peter Parker. This is a general card set of DC Comics superheroes. Text written by Roger Stern. This set corresponds with the comicbook mini-series Underworld Unleashed and depicts many supervillains. A sequel set DC Villains II: Underworld from SkyBox has more chase cards: 9 Spectra-Etch puzzle cards, 3 foil-embossed cards, and a redemption for new comic art SkyMotion card. This set is based on the Lois & Clark television show. Text written by Superman writer Roger Stern. Promo card SC1 On the front are paintings by various artists. 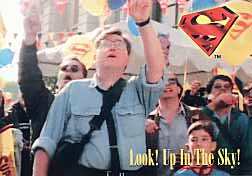 The text on the back recounts Superman's origins as described in John Byrne's The Man of Steel series, Superman's powers, and an overview of his career from his debut to his meeting the villain Conduit. A general series covering DC Comics characters with painted portraits on the front, and descriptive text on the back. Text written by Superman writer/artist Dan Jurgens. SP1 The Adventures of Superman! 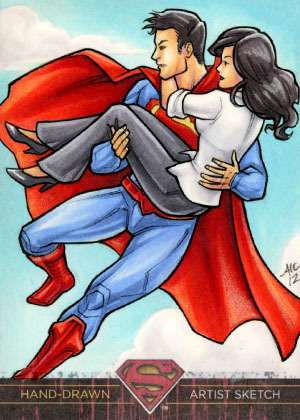 SP3 Superman - The Man of Steel! 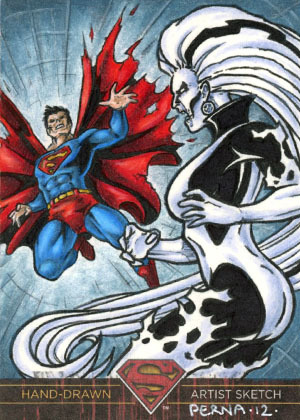 This set was released to correspond with the Reign of the Supermen comics storyline, which followed the Death of Superman and Funeral for a Friend storylines. 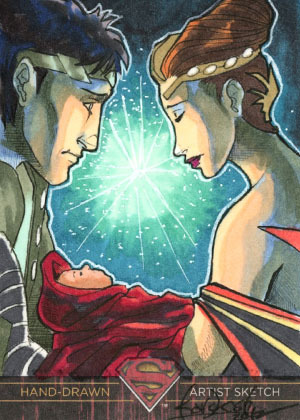 The 99 common cards feature art from the comics, and text telling the story on the backs. 150 Cards, including two checklist cards. 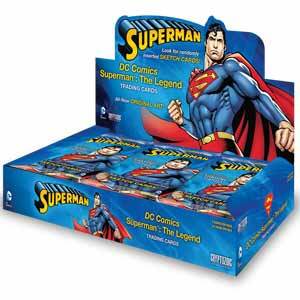 A general set covering DC Comics characters with illustrations on the front, and text on the packs. Some of the card fronts have pictures that fit together to make a larger group picture. 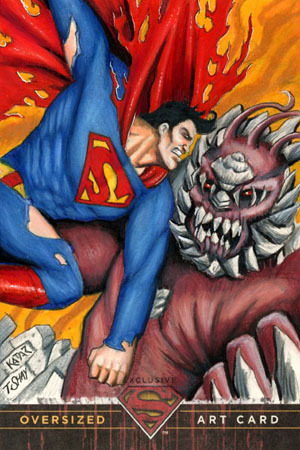 This set was released to correspond with the Death of Superman comics storyline when Superman appeared to die after defeating the monster Doomsday. 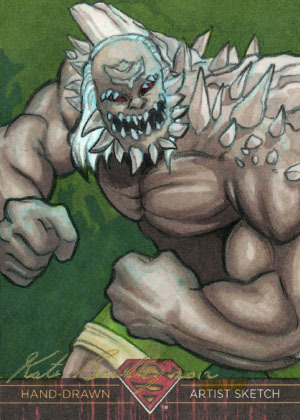 The 90 common cards feature art from the comics, with text telling the story on the backs. The Funeral for a Friend cards have on the front covers from that comic story, while the backs have art which when placed together creates the funeral poster included in the bagged Superman #75. This set broadly covered DC Comics superheroes. Both sets based upon the Supergirl movie. Released corresponding to the Superman III movie. Released corresponding to the Superman II movie. 24 Cards, inserted in Drake food packages. 30 sticker set inserted in food packages, featuring Superman and other DC Comics heroes. The English set has cards slightly smaller than in the test set releashed in the U.S.A. The English set is more common than the test set. 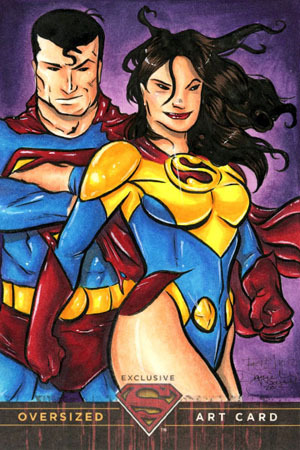 Featuring pictures from the Adventures of Superman television show. 48 Cards, sized 3 2/8" x 2 7/8" cut out from a candy box. Reprinted in 1984 by WTW.